If I do decide to go to Vegas for a fun weekend away, I’ll have to pretty frugal about it as I’ve still have goal of leaving my full-time job this year and I’ve still got a pile of debt to pay off too. Luckily, there are lots of tips to be had when it comes to visiting Vegas on the cheap. Here are a few things that I plan to do to make my trip a little bit more frugal whenever I do end up taking it. Before reading about things first-time Vegas goers need to know, I never would’ve thought about Vegas having high ATM fees, but it makes sense. After all, lots of people who visit Vegas are having so much fun they don’t even bother to check out how much the fee is going to be to withdraw more cash. Now when I go I’ll make sure to take enough cash with me so I can avoid those fees if at all possible. Another way to avoid unnecessary ATM fees is to put all your charges on your credit card instead. I know this may seem like bad financial advice on a personal finance blog, but hear me out. By putting your trip expenses all on one credit card, you’ll be able to track your spending easily when you get back and you might even be able to earn rewards. Just make sure you pay your card off in full to avoid interest charges. While I do want to enjoy the amazing food Vegas has to offer, I still want to try and keep my meal expenses down. Many hotels offer a complimentary breakfast and if you sleep late enough, you might be able to get away with not having lunch at all. When I go to Vegas I’ll probably pick one or two “splurge” meals where I’ll eat at more expensive locations, but for the most part I’m not there for the food. 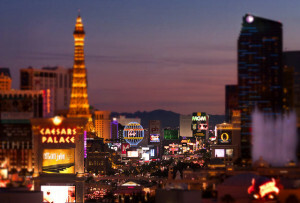 How would you save on your Vegas trip expenses if you were on your first trip to Sin City?